keeping them in stock. Hand crafted on an island off the coast of Maine by a skilled artisan, they are truly one of a kind with their special features and personalities. You also have your choice of color which is found in the body of these urns. The detail starts with the cats face which peers out from the urn itself giving a 3D type of effect. Four of the urns offered have the cat's body etched into the body of the urn itself and it is literally topped off with the cat's tail as part of the urn's lid. The artist's vision was that when looking at the urn, you could envision a crouching cat with a tail happily waving in the background. We have added some very special ones to choose from as well. 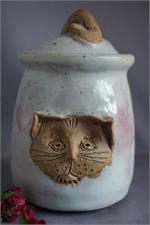 One is who we have named "furry" urn because it does not have glazing on the body of the urn. 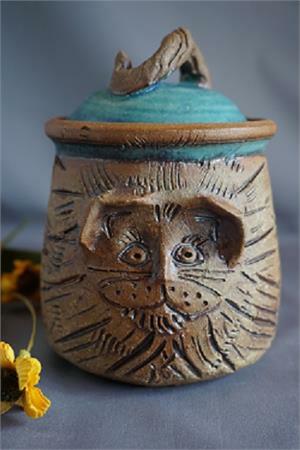 Instead, the artist has chosen to portray a very furry cat thoughout the body of the urn. Also very special is the pastel blue, pink heart urn. Just by the kitty's left ear, the glaze produced a little pink heart. So precious. Whether you chose one of these or any of the others, each has it's own special character and charm. Signed by the artist. As each is so very special, the urn color choice you place in your cart and then is pictured is the exact urn you will receive but be aware that colors may vary just a bit from what is shown due to lighting conditions. Each urn measures approximately 6 inches tall to top of lid.